A 92 year old gentleman presents with an expansile mass in the right mandible which extends into the surrounding soft tissue. He has no known significant past medical history. Routine sections demonstrate tumor cells forming small glands, nests, and single file changes within fibrotic stroma. Some tumor cells have a signet ring cell appearance. Immunoperoxidase stains show that the tumor cells are positive for pancytokeratin, CK7, PSA, and AMACR (p504) and negative for TTF-1, polyclonal CEA, CDX-2, and CK20. Mucicarmine stain is negative. 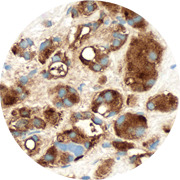 The morphological features and immunohistochemical staining pattern support a diagnosis of metastatic adenocarcinoma of prostatic origin.